HipSaver Wrap&Snap is the another innovation from HipSaver developed in response to requests from nursing staff for a hip protector that is both functional and easy to manage when a resident needs a complete change of clothing or because balance issues make changing a prone resident easier. To change a resident, simply unsnap the drop down crotch panel followed by the front panel. The snaps are reinforced because caregivers told us they wanted a quick, one-handed operation. HipSaver Wrap&Snap is made from a comfortable polycotton fabric in an attractive light coffee colour. 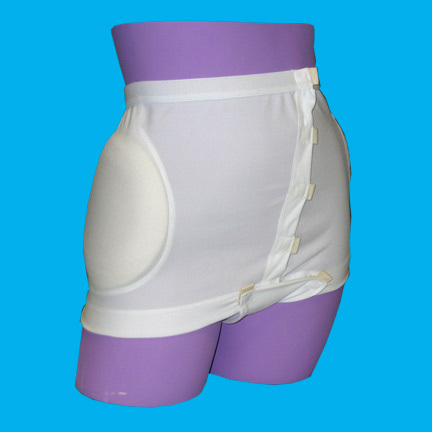 The hip pads are 1/2" thick and measure approximately 7 1/2" in circumference.